The winner will be announced 31st August 2014 at midnight AEST. 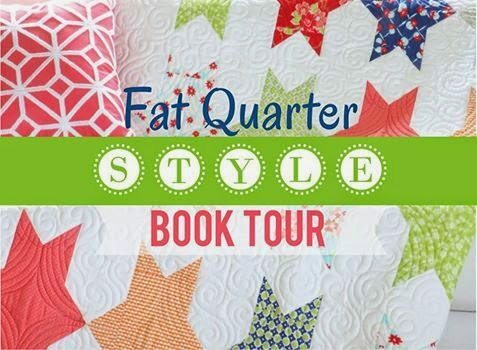 Visit these bloggers to see quilts they have made from the book as part of the Book Tour. Thank you everyone for sharing your favourite nail polish colours. I also wanted to give you a sneak peek of a quilt I am making with the gorgeous Katarina Roccella’s Indelible collection from Art Gallery Fabrics. I am working on this in my spare time (along with many more projects). More on this quilt later. I am a mix of Modern and Traditional. This book looks amazing! I love the bright new fabrics ~ whether in a modern quilt style quilt or a more traditional setting. Thanks for the chance ~ fingers crossed!! Your indelible quilt is making me swoon. Is it bad that I'm not sure I have a style? I like bright colors. I'm kind of geeky, but I love traditional style blocks just as much as funky modern ones. I'm traditional usually, but I'm drawn more and more to the newer styles as time goes on. These new fabric designs were "odd" to me at first, but I'm opening up to them more now. I'm not sure I have a particular style, I'll have a go at most things but I do know I love colour! For me brighter is better. I am more into the modern quilts…love all the fabric designs. My style is eclectic but most of my projects include at least an element of scrappiness and use mainly bright, clear colors. I'm a bit mixed but loving the brights on white at the moment & lots of the quirky picture prints around lately. I'm a modern traditional quilter. I love traditional patterns and fabrics but with a modern twist, does that make senth? My favorite designers are Bonnie & Camille, Fig Tree and Carrie Nelson you can never be wrong with one of them. My style is colorful and modern traditional– I'm not afraid to mix civil war fabrics in either, if they aren't too muddy. And I love to use hand screen printed fabrics too. My personal style of dress is pretty conservative, my quilting is modern, my home is very traditional modern. Your Indelible project looks absolutely amazing! I can't wait to read about it when you finish. I'm still trying to find my style! LOL Lean towards the Modern aesthetic probably but I'm trying different things. I love modern fabrics used in traditional ways. My style is traditional scrappy. But I do love using some of the happy fabrics from current designers, esp Bonnie & Camille and Lori Holt. Love those bright happy fabrics! My style is scrappy. People just give me things they don't want and I make good use of them. Thanks for the chance to win! 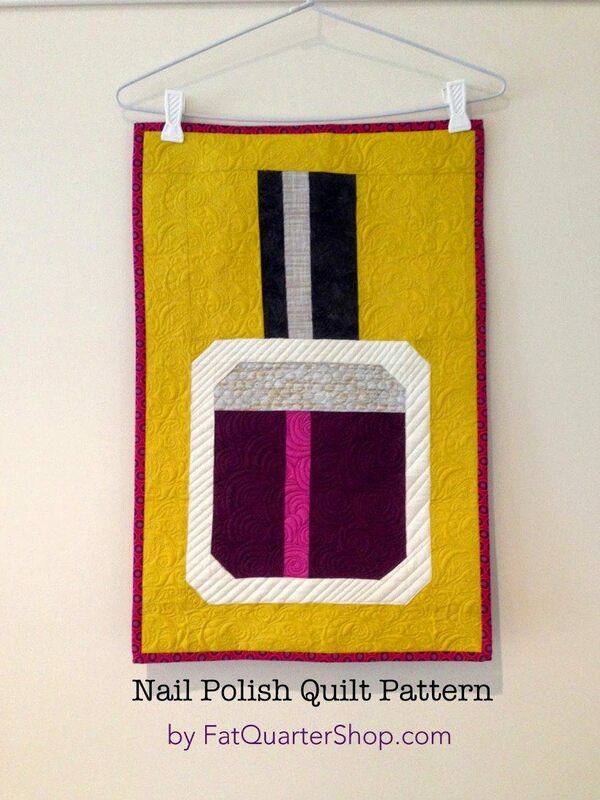 I think I'm more of the Heinz 57 variety type of quilter! LOL LOL From scrappy, traditional to modern and Art quilts… I love them all! I really can't say that I have a style because I make so many different things! I do enjoy Modern quilts a little more now. There are a lot of great designs being created! Thanks for the giveaway! Probably some mix of modern/whimsical. I don't really have a style. I do love the modern quilts I am seeing all the time. I see a pattern and go for it. I usually end up changing the color scheme of the pattern to what color I want to use at that time. 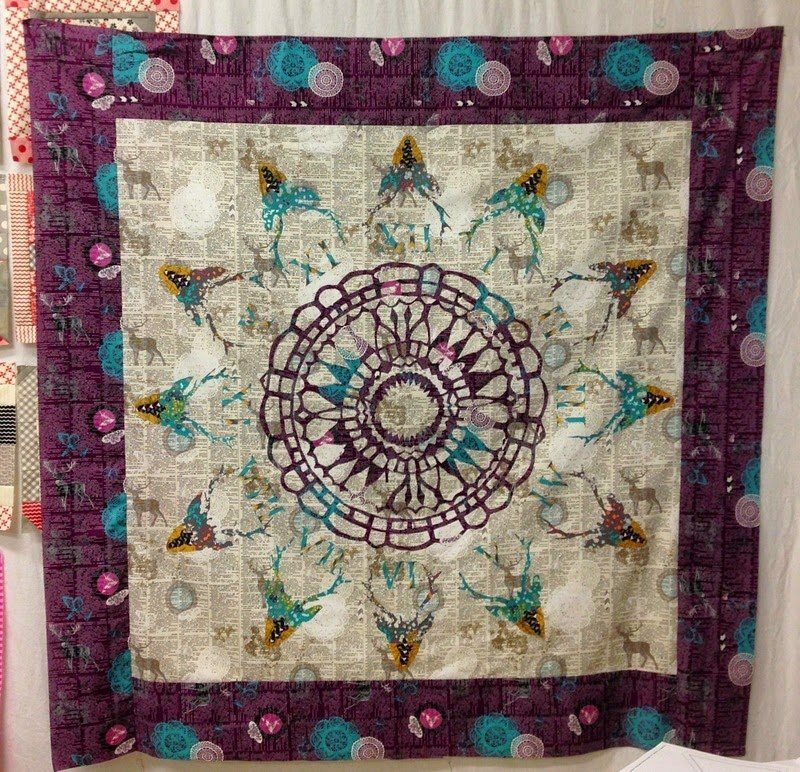 I have to say I like modern in piecing and quilting…. i am sure I have a style. I like fabric with dots, flowers and strips. Colors depend on mood, can fall in love with frilly, period prints and bold colors. I love modern quilts, especially the scrappy ones. Absolutely my favourites! My style is scrappy traditional modernistic. Thanks. I'm definitely a mix of modern and traditional! I'm drawn to bright colors and Happy patterns. I love your quilt your working on, the colors are stunning! Thanks so much for the giveaway! Modern traditionalist. My root are in traditional but my heart is in modern. I'm not too sure what my style is, it kind of varies from week to week. I don't think I have just one style. I do love the modern quilts out, but I think I'm pretty eclectic. I love traditional. My modern pieced are enjoyed during the making process; however, were intended as gifts upfront. I like to call my style naive modern. This allows me to avoid precision piecing where all the pints meet perfectly and every seam is exactly 1/4 inch. Maybe another name for my style is slap dash and impatient??!! I like working in a lot of different sytles but I'm definitely not a brights person! Thanks for the lovely giveaway. Scrappy definitely. I love a little bit of everything rather than matching anything. My style is bright colors, a little bit old-fashioned mixed with a little bit new. It's really all over the place! I look to the web for ideas….then make stuff up as I go without any real pattern so…experimentalist? And almost always with earth tone batiks. Hi Jane! Thank you so much – I'm so so happy I won the gift certificate! Your NEW Project looks very exciting and those Fabrics are gorgeus! My style is scrappy, fun and perhaps sometimes modern. But please don't count me for the give away – that wouldn't be right. I'm traditional, but at the moment I'm really into very bright, bold colors. My style is hard to describe, but I'll call it modern vintage. I love the quilts from the 30's dressed up a bit with modern fabrics. My style is quirky and scrappy. I love the older, traditional quilts. I'm pretty modern with my style, mostly because it requires an eye for the feel of a piece but with less effort (um, not about to undertake a Dear Jane any day!). It's like abstract art to me, and I love that! What is my style, you may ask? I'm not sure I have one yet! I'm "eclectic" I guess. As I look around at what others have made, I gather ideas and make something unique. I usually choose bold, colorful fabrics with simple templates. I do like variety! I guess my migrate to bright & cheerful with a more traditional feel. Thanks for the chance to win. Oh fun! I guess my style would have to be called eclectic! I'm still at the learning stage, soaking it all up like a sponge!! Always trying something new, a different challenge! My style is evolving. I am becoming "more modern" all the time. Love it! Well, I never thought much about style, LOL and I've been quilting for over 40 years. If I had to choose I'd say it was traditional. 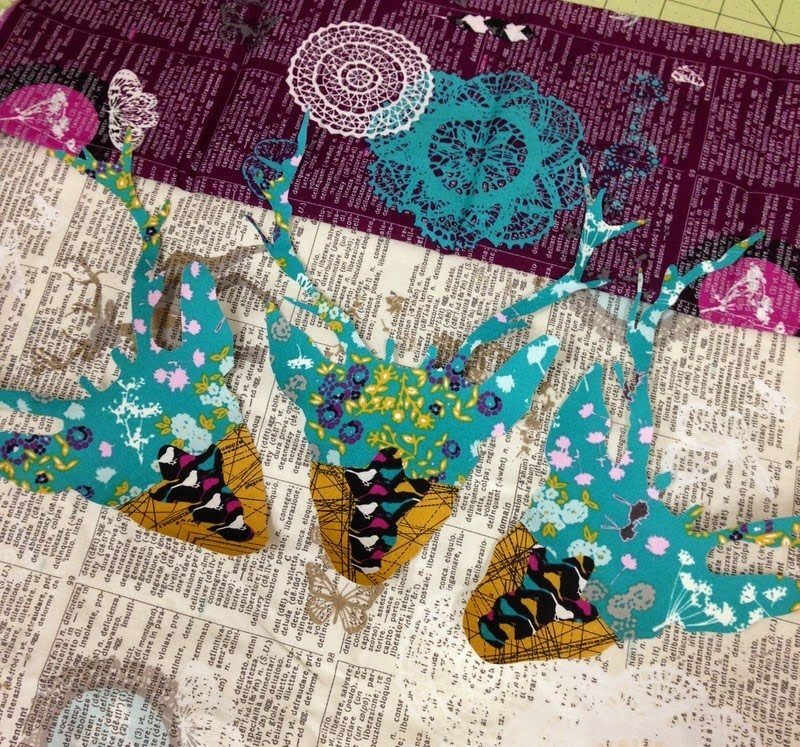 I like piecing best, but have tried lots and lots of different kinds of quilting. I, now often use modern quilting ideas for the backs of my quilts. I am a traditional quilter but I'm being drawn to some contemporary designs. I love scrappy quilts; the more fabrics, the better. Thanks for the giveaway! 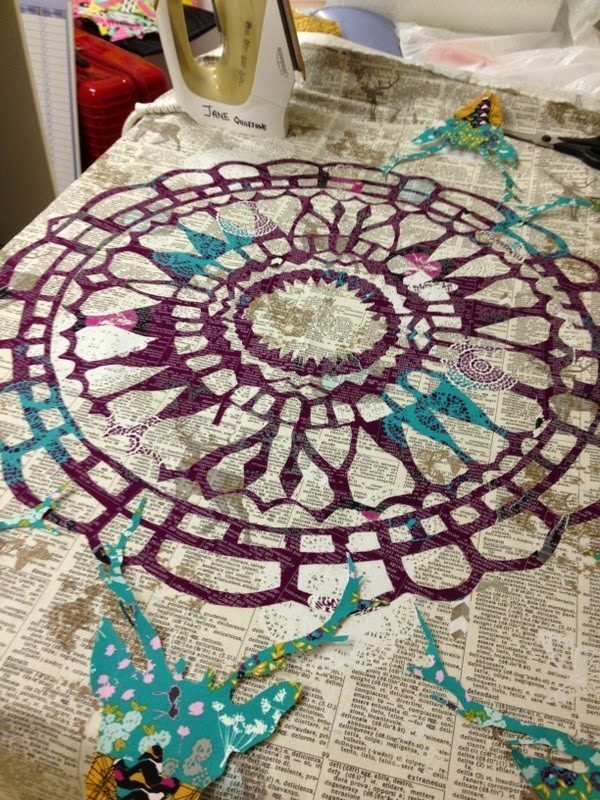 Wow, Jane, great quilt in the making! I tend to make traditional blocks with modern fabrics and a twist. My style is very eclectic. My projects tend to be traditional when sewing for my home. We have a 1930s English Tudor home, but when I sew for others I get a litter braver and use bright colors and take chances. There is nothing that I don't like though. My style would range from modern quilting to custom art quilts 🙂 What a great giveaway! I like traditional patterns, with scrappy fabrics. I like lots of colour! I haven't quite defined my style yet. I seem to like everything quilty!! But I guess I gravitate toward graphic designs and bright colors. My style is pretty much anything. I love traditional, modern, scrappy, applique, etc. I love things that are "easy" as I don't have a lot of time to spend on making things. Working full time takes away from that! Thanks for the great giveaway! Love the scrappy look, whether using a complete range of using leftovers! Thanks for the opportunity to win a giveaway! Hmmm I guess you would say my style is eclectic! A little bit of improv, sometimes I use a bit of old fashioned homespun and then other times I make a quilt from a pattern that I love! Eclectic contemporary I suppose!! Honestly, whatever I like. I never pieced because I couldn't bring myself to do all those little fiddly pieces, and I didn't handquilt because I didn't like all those traditional designs. But then I found crazy patch and stash quilts and anything goes with color and design and FMQ!!!! So now I do it all but still not so traditional. Thanks. I am definitely a more traditional, scrappy & country girl. Love Kim Diehl, Kansas Troubles & primitive quilts. This book is on my list. Thanks for the chance to win one! I'm not sure I have any style! I like modern vintage, though I do think the word 'eclectic' describes me! I have a 'do what takes my fancy at the time' style! My style is a mix of traditional and contemporary. Thanks for the opportunity to win! Traditional with fresh fabrics. Thanks for the chance. I love all the traditional patterns but I'm also interested in trying my hand at some of the modern quilts I've seen lately. I love traditional quilts…and the scrappier the better!! Thanks for the chance! My clothing style is comfortable… but if I was physically healthy & fit I'd dress like Taylor Swift (more vintage.) 🙂 For quilt style I have no idea, it's more sentimental than anything. Is that a style? BTW that is the loveliest quilt I've seen in a LONG time! WOW! My style is quite modern with a classic twist! My style is whatever strikes me as pretty. I love well- coordinated colors . My style is hard to describe but is most traditional with modern touch.Thanks for the chance!